Humanscale is proud to announce that its widely acclaimed Freedom Chair is the star of PLAY, a new exhibit currently open at the Gagosian through October 13th in Chelsea. Renowned Swiss contemporary artist Urs Fischer has collaborated with New York-based choreographer Madeline Hollander for the imaginative installation that features nine unique Freedom chars as they playfully dance throughout the space in synchronized yet surprising movements. 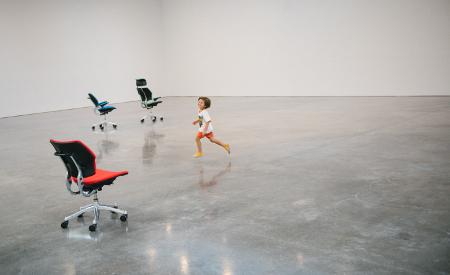 “At the intersection of sculpture, behavior, and choreography, PLAY is an arena of chance encounters where visitors are invited to interact with nine office chairs that seem to have lives of their own,” according to the Gagosian. The chairs are specifically programmed in the exhibit to move automatically in response to viewers. They interact with the audience as they advance towards and depart from passers by. As viewers engage, it soon becomes clear that the chairs are not puppets but rather agents in this game. Chairs, which are normally viewed as inanimate objects of simple functionality, invite the audience into their fictional world; or perhaps the opposite happens as they come alive to join the human experience. 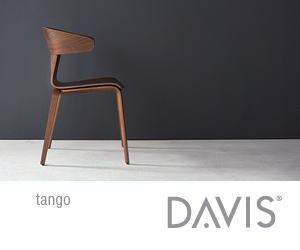 The Freedom chair’s iconic design is defined by unparalleled beauty and functionality. Designed in 1999 by the late Niels Diffrient, the renowned industrial designer and champion of ergonomics, Freedom and Freedom Headrest raise the bar for ergonomic task seating. 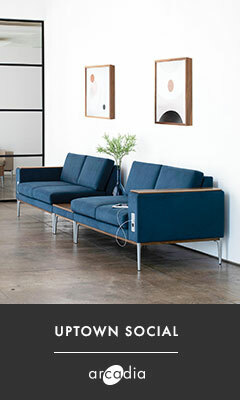 Freedom was the first task chair to include a self-adjusting recline mechanism that adapts to and supports the user’s body at all points during recline. The chair’s core design also includes synchronous armrests which allow for constant ergonomic support of the spine and arms even as the user moves while the Freedom Headrest offers additional head and neck support. “When you recline, you don’t have to adjust the chair – it adapts to your body weight,” said Niels Diffrient on the chair’s ability to provide custom ergonomic support. Freedom of movement, a concept intrinsic to the chair’s engineering, takes on new meaning in PLAY and the exhibit’s debut arrives on the cusp of Freedom’s 20th anniversary to be celebrated in 2019.